Remember me? The one with the hubs who buys FIFTY POUNDS of potatoes for $7.00 ??? Yeah that’s me… I always have lots of teens coming in and out so I always double my recipes, or bake an extra couple potatoes. It comes in real handy if they are hungry or not. 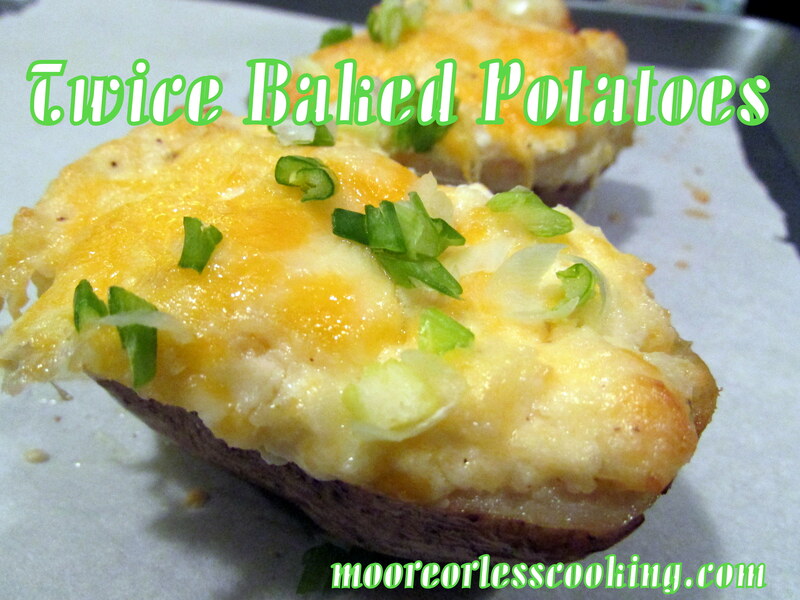 I made these delicious Twice Baked Potatoes with a couple extra baked potatoes. This recipe is for two people, but you can always double the recipe. Recipe is adapted by The Duchess of Fork….Isn’t that a great name for a blog??!! Preheat oven to 400 degrees. Scrub potatoes and dry completely. Bake potatoes for 30 minutes. Remove from oven and prick each potato with a fork a few times. Return to oven and bake 30 more minutes. Allow potatoes to cool long enough to handle. Cut the top of each potato off lengthwise. Remove flesh from top and bottom, leaving enough so that the skin holds up. In a bowl, mash potato flesh with butter, sour cream, salt, pepper, garlic and 1/2 cup cheddar cheese. Stir until all ingredients are combined. Press potato filling back into potato skins. Top with remaining cheese. Lower oven temperature to 375 and bake for an additional 25-30 minutes. Delish. The only thing better than a baked potato with dinner is adding sour cream, butter and cheese! The color of this dish is really so nice ,hope i to can make!! !